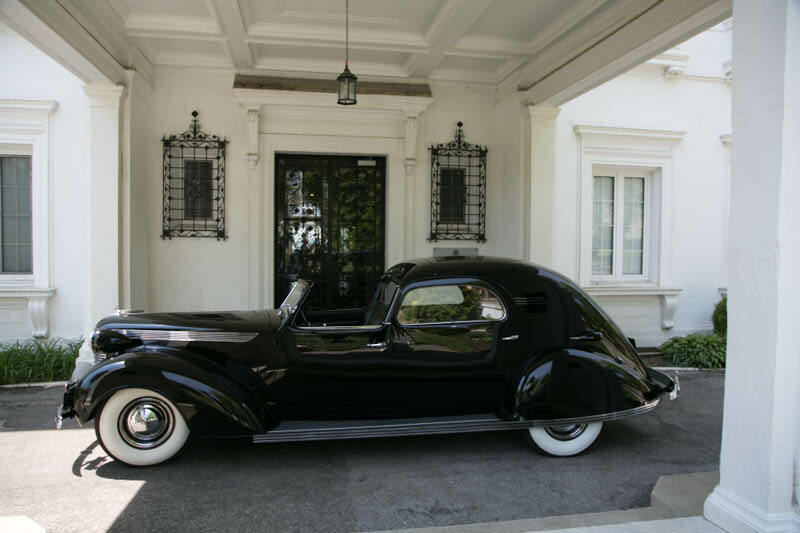 After 74 years, Chrysler's Chrysler has returned to its original Kings Point home this weekend. 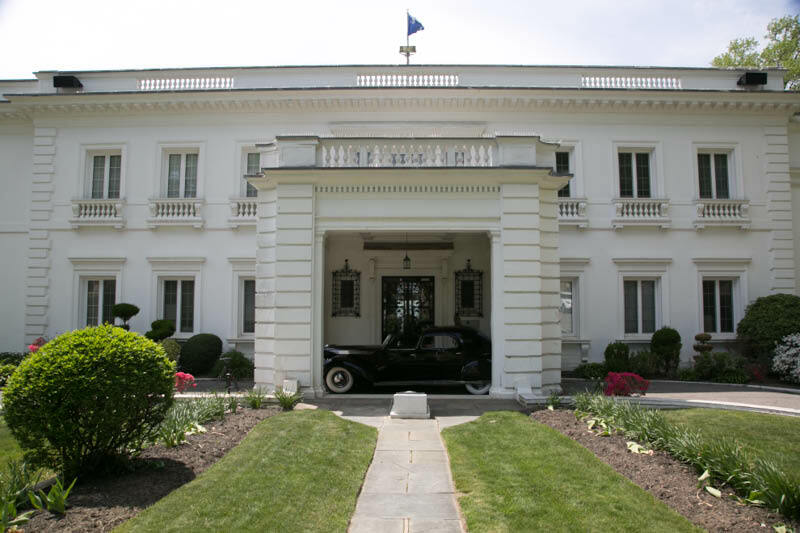 A photo shoot was held on Friday around the former home of Walter and Della Chrysler, now Wylie Hall of the U.S. Merchant Marine Academy. Chrysler's Chrysler and over 75 vintage automobiles will be on display today at the first car show ever held at the Kings Point. Come out and support the wonderful midshipmen of Long Island's federal service academy. 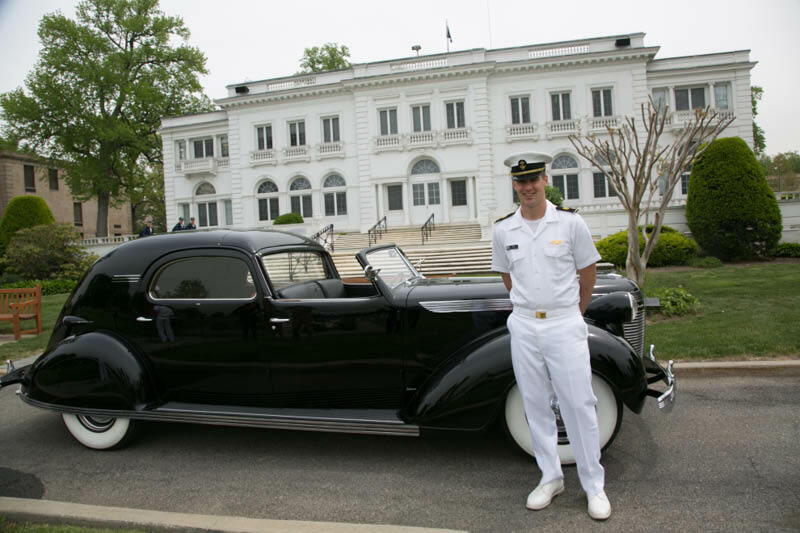 Midshipman Paul Styx, President of the Kings Point Auto Club, organized today's car show, whose proceeds will support future activities of the club. Hemming Classic Car Senior Editor Richard Lentinello conducted a photo shoot for a future feature article. Richard Lentinello and automotive historian Walt Gosden. Howard Kroplick was filmed by Cablevision's anchor Danielle Campbell for a future "Long Island's Hidden Past" segment. A demonstration of the unique spring-loaded power windows of Chrysler's Chrysler. Chrysler's Chrysler parked under the portico for the first time in 74 years. Thumbs up for the amazing mirror finish of Chrysler's Chrysler. Friday’s photo shoot was an amazing time. 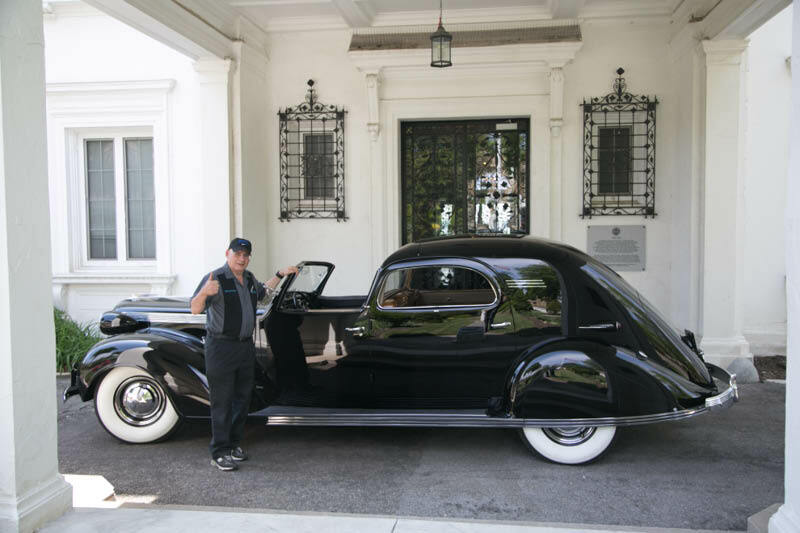 It was a very moving emotional “homecoming” to see the Chrysler parked there at the back of the Chrysler mansion. 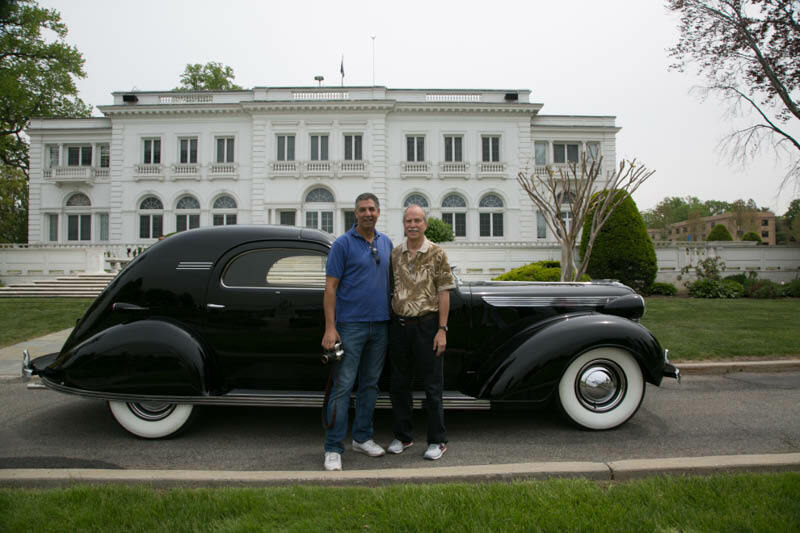 Great to see my editor and great friend Richard Lentinello for several hours as he photographed that magnificent car. Photographing a black car is not an easy task! The mirror finish reflects everything . Look for a full two part story in consecutive issues of Hemmings Classic Car magazine towards the end of this year, of both the history of the car and the extensive restoration it received. Hats off to you Howard and Roz for stepping up to save this car, see it restored correctly and authentically to the absolute last detail and now share it with all of us, AND keep the car on Long Island where it has its heritage. Just like stepping into a time machine. Amazing! Great show! Very proud and honored to have had this experience! 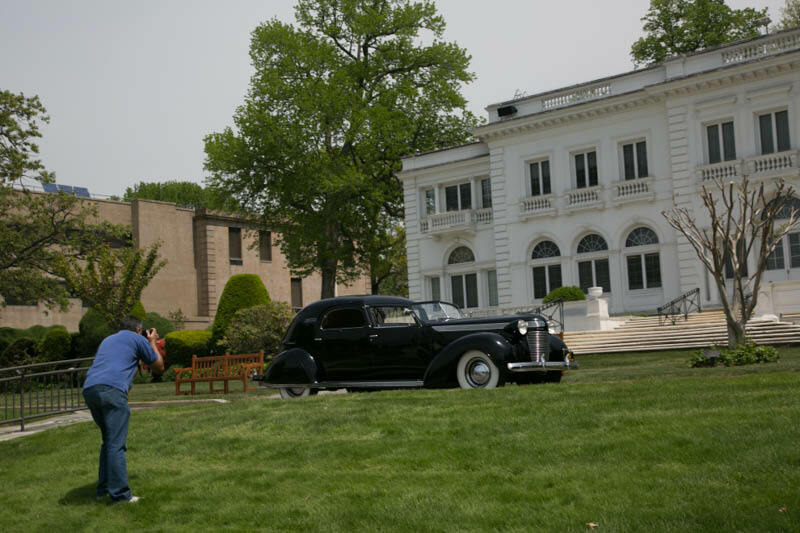 I recently learned that you exhibited the Chryslers’ 1937 Imperial town car at the former Chrysler estate on Kings Point. I was gratified to see that car in that place. I’ve written about Chrysler automobiles and Chrysler history for many years. I believe that the man and his corporation were deeply influential, yet they are woefully under-appreciated today. This may sound strange coming from a complete stranger, and stranger who didn’t even attend the show, but thank you for driving the Imperial home. Not only are you a top historian and collector, you have clout with the US Merchant Marines. Well deserved, should be a great day.